Since the days of arcades, fantasies have put gamers inside of the cabinet. Tron was a movie about the world inside of arcade games. More recently, movies like Wreck-it Ralph and Ready Player One have imagined the worlds beyond the screen. Virtual reality has always been about realizing those fantasies and dreams, breaking down the boundaries between the player and the experience and letting them step inside themselves. Operation Warcade puts players in a virtual arcade inspired by the ’80s, but enhances that nostalgia by letting them lean into those cabinets. It’s a kind of virtual reality within virtual reality. Serving itself up as a lightgun shooter, Operation Warcade offers the opportunity to play an ’80s style side-scrolling arcade game in an actual virtual arcade, even if that virtual arcade surrounds the player by hilariously bad graphics. You can take this one of two ways. Either the graphics are actually just that bad, or it’s a nod to the bad graphics of yesteryear. The ambiance of the arcade isn’t the important part, however, as you should be focused on the arcade games in front of you. While you won’t get to play all of the cabinets scattered around the arcade (maybe the next game will offer more arcade titles), you’ll have your pick of two Operation Warcade cabinets: Classic 3D Edition and Immersion Edition. Each one is the same game, but they offer two very distinct experiences. Classic 3D is what you might expect. This is a virtual lightgun game, where you’ll be using your choice of control method—DualShock 4, two Moves, or the Aim Controller— to aim at a virtual two-dimensional screen. Soldiers and vehicles will cross the screen, and much like any arcade shooter, you aim at the screen to clear them out. Much like those arcade games of old, you’ll use credits as lives to get through each level. Classic 3D Edition is the nostalgia mode, letting players relive the days of picking up plastic guns and pouring quarters into a cabinet while aiming for the highest score. While it’s a nice little trip down memory lane, it never really justifies its use of virtual reality. Why bother entering VR just to stare at another flat screen? Fortunately, Operation Warcade isn’t all about standing around a virtual arcade, playing a game within a game. There’s another mode that expands the experience a little further. On the other side, Immersion Edition lets players quite literally lean into the screen, the soldiers and vehicles inhabiting a three-dimensional environment beyond that flat boundary. Grenade and one hand and SMG in the other, Immersion Edition doesn’t play out too differently from the Classic 3D Edition, but the ability to lean in creates an entirely different and immersive experience, earning its name. Notably, having the two modes right next to each other really helps to give an A/B comparison of one mode to the other, showing the kinds of benefits that VR can offer over flat screen productions. 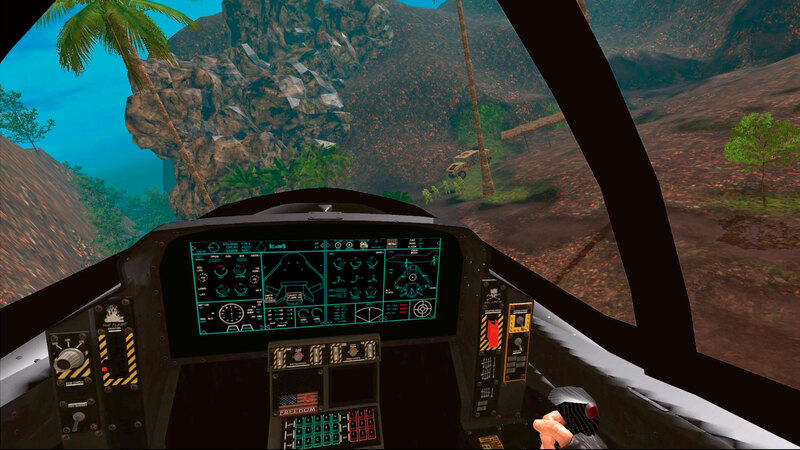 Even with graphics as terrible as these—and Operation Warcade’s graphics are pretty awful—immersion allows you to forget about that for a moment while you focus on shooting the bad guys. Where one might think the ability to literally lean into the screen might create some advantages, it actually reveals some of the shortcuts taken in game design. The enemy units take a very long time to load in, and by leaning in and looking side-to-side, you can easily see them appear out of thin air. It barely offers any advantage to get to see just beyond the edge of the screen when the soldiers aren’t even spawning in until they are basically right in front of where the screen would be. Immersion Mode has immersion points that players can shoot to be transported into the battlefield. Instead of just leaning into the screen, you are now behind a barricade, inside of an airplane, or firing a Gatling gun from the back of a boat. There are a huge variety of these immersive points throughout the game, offering breaks in the gameplay that help transform Operation Warcade from standard lightgun shooter to something a bit more interesting. Often times these points tie into challenges that must be completed to advance, such as killing three enemies while parachuting out of a plane, or tagging three soldiers with a single explosive arrow. There are six environments, each with six levels, and each of those with three different challenges to tackle. For those keeping score at home, that’s 108 challenges across 36 levels. Challenges are tied to progression and unlockables, which can give entirely new ways to play. Early weapon attachments and modifiers are relatively simply additions, like a targeting system for your gun, to crazy add-ons like a levitation bomb or gravity gun. Progression happens at such a natural cadence that Operation Warcade becomes addicting to play, either trying to fulfill challenges, or having fun trying out new attachments and upgrades. There’s a constant variety to the gameplay that I didn’t expect it to have in the long term. All that said, the graphics are still terrible in a pretty standout fashion. 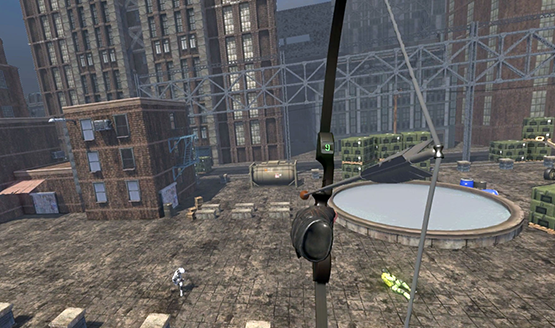 Environments are drab, sparse, and boring. Objects pop in at annoyingly close distances. Textures are awful. It might have been a little more forgivable in the early days of VR, but this far in, I’m a bit more critical of visuals that are this poor and barren. There’s a fun and addicting game when you get to the nitty-gritty of the gameplay, however all of that comes in a pretty ugly package. Some of this might have been in pursuit of an authentic ’80s experience, but it looks more like something from the early 2000s, and not for the better. Stepping into this classic arcade, I didn’t have high hopes. Operation Warcade is the kind of game that’s easy to quickly glance at and readily dismiss on visuals alone. I’ll by the first to admit that it failed to grab me initially. It was only once I got playing that I realized the kind of potential it held, in spite of its relatively cheap look overall. Operation Warcade isn’t looking to compete with top-tier AAA games, but it manages to settle into a spot of being an addictive experience to play on repeat. The brief levels offer a perfect bite-sized morsels, and you may even end up biting off more than just a nibble each time you play, slamming just one more coin into the slot to start another round. Operation Warcade review copy provided by publisher. Version 1.01 reviewed on a standard PS4. For more information on scoring please see our Review Policy here.